I feel interest in solar cell. A site sells small solar cells. I calculated price per area of them. Solar cell price seems proportional to area. If area of solar cell is twice, output is also twice actually. I think that a small solar cell can measure illuminance witout external electric power. 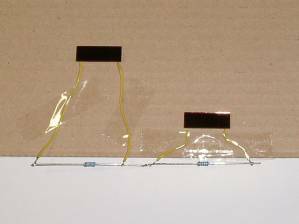 A site shows equivalent circuit of solar cell. Illuminance depends air mass. Air mass is proportional to atm and inverse propotional to zenith angle. A site shows solar output monthly. The power is one third in winter. Chichibu is located in Kanto, so it is fine in winter. Output decreased in June. It is rainy season in June in Japan. Inverter is one of bottle neck of maintenance. Capacitors of inverter have to te replaced regulary, I suppose. Two tiny solar cells were delivered today. I probed one of them by a digital meter. It output more than 1.5 V under a desk light. Looking the cross section of it, I found no layers. I thought of a Si wafer. Googling, it is a thin membrane solar cell. It consits of 9 layers including electrodes. It prints 'TRONY' and 'SC1025IDS' inside. TRONY supplies for CASIO and CITIZEN. If one changes 'TR' for 'S', TRONY is SONY. I show the specifications of it by a reseller. It has 4 electrodes inside. Two electrodes of the left side has no excited mV. They contact one another, maybe. The electrodes seem pasted. I will solder wires. How do I eliminate thermal effect while soldering? I soldered 2 thin wires on the electrodes. I don't know the wire gage correct, AWG26 or 28. I measured the open output by measurements of TDS310. Sampling is 5 ms/div (10kS/s). Illuminence of my desk may be more 200lx, because the specification shows that the output of the cell is 2.0 V under 200 lx. Room light fluctuates at 120 Hz. I live in area of commercial 60 Hz. It seems the solar cell has big capacitance, so the ripple of 60 Hz is measured. I loaded resistance of 56k and 6.8k Ω. Load resistance of 6.8 kΩ may measure room illuminence of 20 folds. I attached the solar cell with 6.8 kΩ on a west window. I read measurement of Min. I wrote a program of Visual Basic to get illuminence on a tick of minutes. See My old PCs04 and PCs05 in My old personal computers. It was fine this morning. TDS310 and the program measured for an hour. The peak was 1.02003133297E0 at 9:35. E0 means index of power of 10, that is, 100 = 1. Parameters of TDS310 is the same before. I think of charging a battery. I had better Min and Max at the same time. It is rainy this morning. I rewrote the program to get 2 Measurements of TDS310. Average ofTDS310 is 2. Max differs approximate 20 mV from Min. I think this is noise. Averaging is 2. I began measuring at 5 ms/div as usual, but the displayed measuremt values continue to show the same value. I found that 'Auto' or 'Trig?' had to show alternative, when I measure a varying value slowly. I changed time division into 25 ms/div. I added another solar cell with a load of 6.8 kΩ. It was fine. I measured the outputs of the two cells by 2 channles at sampling rate of 2KS/s. The sampling rate is 25 ms/div. The both vertical range were 500 mV/div. Output of Ch2 was different from Ch1 by 7 %. The resistor of load have only 1 % error. Why did they have different characteristics?